Tamara is a grants and contracts assistant in Pact's Ukraine office. There was a time when Maksym Zadorozhnyi could vaguely see the world around him. He can still remember colors, although they too went away when he became completely blind at age 12. Now 26, Maksym is the kind of person who easily cheers up friends with his jokes and smile. Maksym was born in Vinnytsia, in western Ukraine, and moved to Kiev in 1997 to attend a specialized high school for the blind. It was there that he took an interest in computer science. He has fond memories of an especially good teacher who allowed students to play computer games tailored to blind children. Maksym’s interest in computers deepened when a Ukrainian university took his high school under patronage and began offering intensive computer science classes there. After graduation, Maksym obtained a qualification in computer typesetting. Later, he studied at medical college for three years where he gained another qualification in massage therapy. He began working as a massage therapist, but his interest in computers remained strong. On the side, he helped blind people to become computer users. Last year, Maksym got a call from a friend who invited him to join an effort called See the Hope. Supported by Pact's UNITER project, See the Hope was looking for advocates interested in advancing the social inclusion of visually impaired people in Ukraine. Maksym was exactly the right person to call. Soon, he became a computer literacy trainer, teaching 32 students to use a voiced version of Microsoft Office, which Microsoft donated. Few blind people in Ukraine are aware of the technology, and even fewer have opportunities to learn and use it. Soon Maksym took another step. With his new skills and help from See the Hope, he got a job at a call center for one of the country’s largest mobile operators. It was a major accomplishment, especially in light of employment stereotypes in Ukraine, which generally limit blind people to professions such as massage therapy or music. Although blind people are able to perform many of the same jobs as those with sight, getting hired is another matter. Only about 20 blind students graduate from Ukrainian universities each year, and most remain unemployed, according to the Ukrainian Association of the Blind. Ukraine has no employment strategy for the blind, and the state does little to encourage employers to hire people with disabilities. Maksym at his work station. With See the Hope’s support, Maksym overcame the odds. “If I came off the street, they would not even consider me for that position,” Maksym says. He was the first blind person to be hired by his company – a step that may begin to break down barriers in the sector. But that wasn't enough for Maksym. 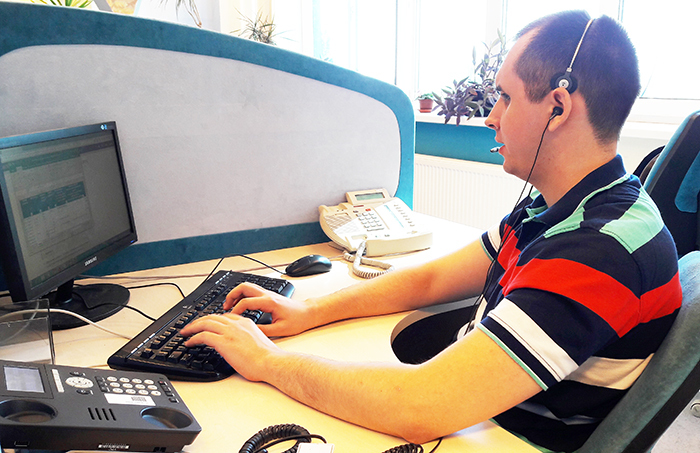 He is now working to recruit and train a group of blind people to work with him at the call center, an initiative that his company is supporting. “The group is the first priority for me now,” Maksym says. “I have already proven to myself that I can do it. The next step is to help others realize it. I understand that by personal example I can give hope to many others.